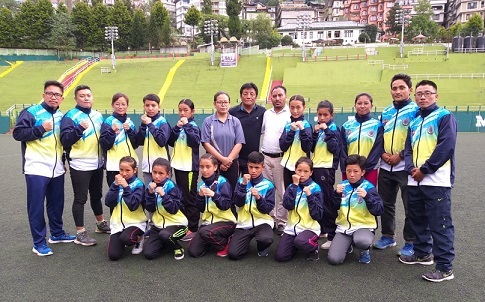 A 10-member team of young pugilists of Sikkim Boxing Association (SBA) is all set to represent Sikkim in the first Sub Junior Women’s National Boxing championship to be held from September 2 to 7 at Nagpur in Maharashtra. The championship has been organized by Boxing Federation of India. The team will be leaving on Thursday morning for the championship. The team members are Dikila Lepcha, Pemu Tamang, Geeta Subba, Sita Subba, Simran Pradhan, Ganga Biswakarma, Sarathi Mukhia, Tenila Sherpa, Prava Gajmer and Anne Lepcha. The team will be accompanied by Pratima Gooroong as head coach, Vabiya Gurung as assistant coach, Praveen Limboo as manager and Usha Rai as referee/judge. In a small function here at Paljor Stadium conference hall on Wednesday afternoon, SBA officials conveyed their best wishes to the team members and officials and encouraged them to give their best to win medals and bring laurels for the state. On the occasion, Sports & Youth Affairs Department Deputy Director Thupten Rapgyal said sub-junior national is the first platform for a pugilist to move ahead in the boxing. He encouraged young girls to be serious and to learn from this opportunity at the national level to be successful boxer in the future. He further urged them to move ahead with hard work and dedication and with a target to represent the country in the near future. Rapgyal urged them to maintain a good discipline to keep the name of Sikkim on the top. He encouraged them to have the competitive spirit to perform in their bouts. SBA general secretary RK Biswakarma expressed his gratitude to Tripti’s for sponsoring Rs 40,000 to the team. He said Tripti’s has also assured to continuously support sub-junior boxing team of the state for lifetime. Pratima Gooroong, head coach of the team, said all pugilists in the team are fit and in form to give their best in the championship.